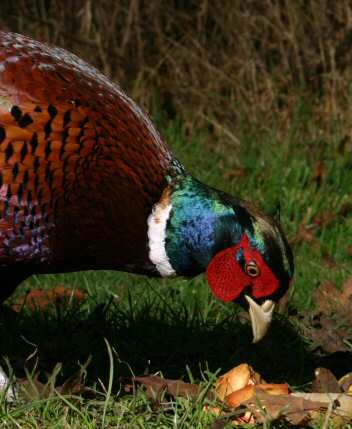 Pheasants and Partridges are call 'Game Birds' because they are shot for sport. There is quite a lot of shooting of rabbits round here, but no organised bird shoots that we know of. Never the less they get disturbed and seem to like the peace of our rough grass areas. 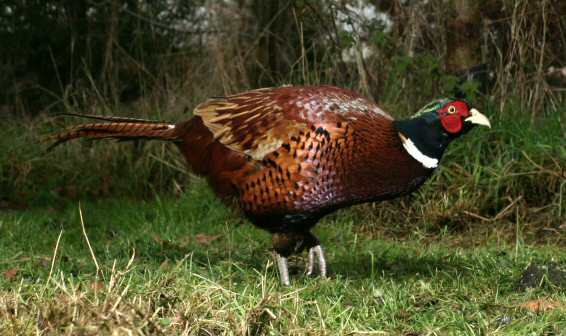 This male pheasant is typical of the glorious exotic colours the males carry year round. They are predominately vegetarian though they will take an insect if it is convenient. This Pheasant hen (female) is a little lighter than what we typically see but the patterning is similar. Note how confusing the pattern on her back is - when she is sitting on a nest it renders her almost invisible in long grass. Having nearly trodden on one while crossing a grass area we can attest to its good camouflage effect. The males feathers show fantastic iridescence when the lighting is right. This is not the 'colour' of the feathers but the effect of the fine structure of the feathers producing 'interference' effects with the wavelength of light. You can see the same effect on a CD or DVD surface when you get the angle right. 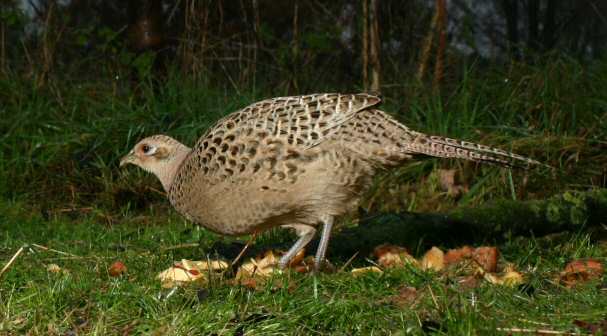 We occasionally see partridges when they are frightened out of the adjacent fields by grass cutting. We used to see mainly Red-legged Partridge but now see only Grey Partridge. They are very nervous and difficult to photograph, and we have never picked up a picture in the automatic camera. 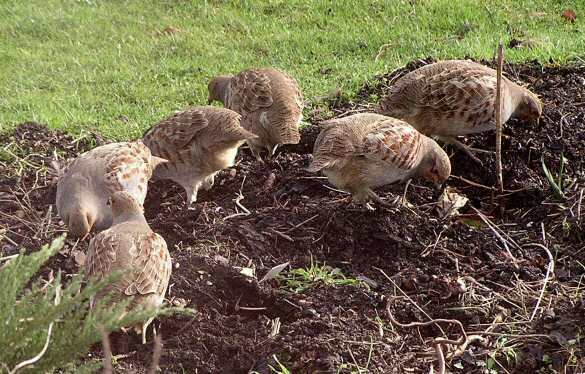 This image shows a young family rooting about in a mulched area of the back garden.